What does this mean?DOCSIS 3.0 has a maximum speed of 100mb on the Cox network. 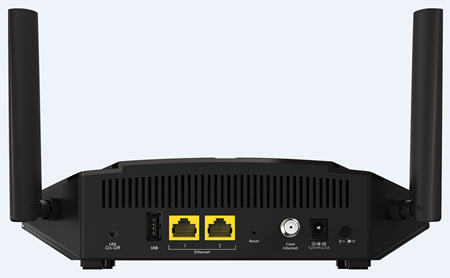 After the cable modem is successfully registered on the network, the Power, Receive, Send, and Online indicators illuminate continuously to indicate that the cable modem is online and fully operational. For more details, refer to the Modem Lights section. Reset - Use this button in the unlikely event that you want to restore the default factory settings. This button is recessed to prevent accidental resets of the WiFi modem. 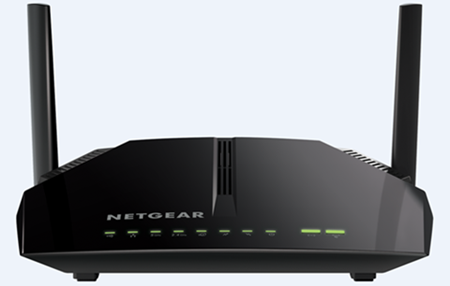 See Netgear's support article for steps on how to reset the device to factory settings. USB 2.0 Port - Connects to the USB port on your computer. LED On / Off - Use this switch to power the LED on or off. Ethernet ports - Two ethernet ports to connect devices such as a computer. Coax / WAN - Connect your coaxial cable line to this port. AC IN - Connect the supplied power cord to this port. Power On / Off - Use this button to power the device on and off. The information below is usually found on a sticker located on the bottom of the gateway. The S/N is the serial number. The CM MAC is the MAC address. The lights indicate the current status of your gateway. To troubleshoot any connection problems, use the table below. Blinking Green The device is attempting to connect with a network. Solid Red Power is cut off due to a thermal error caused by heat. Solid Green None - connection from the computer to the Internet established on one or more channels. Off No downstream channel is locked. Solid Green None - connection from the Internet to the computer established on one or more channels. Blinking None - The modem router is synchronizing with the cable provider’s cable modem termination system (CMTS). Blinking There is WiFi traffic on the 2.4 GHz band. Blinking There is WiFi traffic on the 5 GHz band. Off A device is not connected to the Ethernet port on the back. Solid Green None - A device is connected to the Ethernet port on the back. Blinking The Ethernet port is sending or receiving traffic. Off Connect a device to the USB port to back of the device. Solid Green None - A device is connected to the USB port on the back. For more detailed technical information use the resources below.